Hey folks, know I haven’t updated in a while. There’s not been a lot that’s really worth posting since I left Whistler, plus the motivation to do it has died a bit. It’s easier to stay in contact. Perhaps I’ll start writing this again but really it’s run of the mill “went drinking, went to work” at the moment. But, there is a good reason for posting this particular entry. 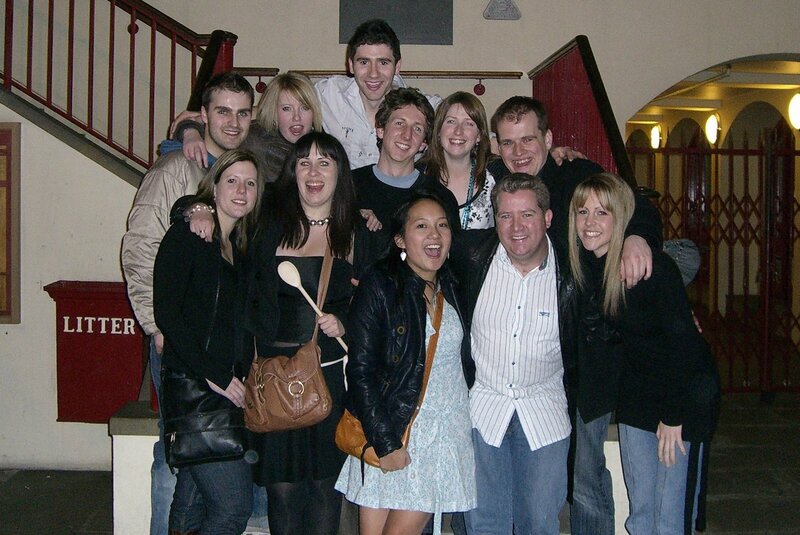 Last weekend, Shane, Caroline, MC, Alex, Elaine, Helen, Andy, Janet, Alan, Hayley and Me all met up in London! My god it was good to get together! We started organising the meetup in December, so that the Scottish/Irish Girls/Girl had time to book flights from Glasgow/Dublin/Edinbrough and Helen could plan to get here by road, everyone else was in London. (FYI, I’ve moved down here from Leeds to work at a software firm doing Siebel Support). After quite a bit of sticking about the date we settled on it, and last weekend was it. 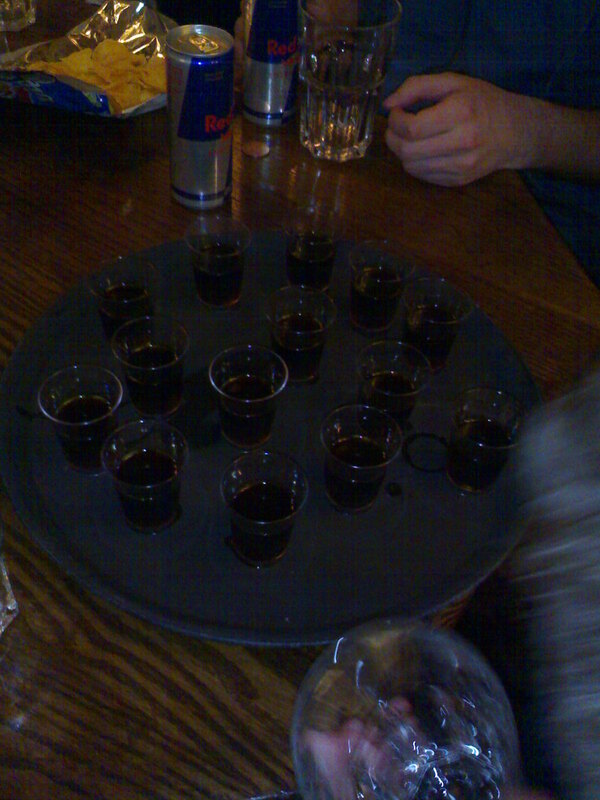 So… we had to hit the Jager! Over here its cheapest to buy 2 shots of Jager + A full can of Redbull (which they usually try and mix, known as a JagerBull, we insist they DO NOT). Slammed those quick and tongues started to loosen. I was defiantly making “less than shy comments” (sorry MC). Barrelled out of Weatherspoons, got some munchies in McDonalds, headed to a bar called Fuel (or something?) in Covent Garden. For those of us who are not 6 foot 3 inches (which as you may remember is every bloke there) this club was very roomy, vertically, however muggins here, Alan and Alex all got sore necks. Hayley also invented some weird thing where she puts her cardigan on your arms, backwards, and then dances infront of you so it looks like your arms are hers… very creative but could go so wrong. Headed out, took a group photo. Hopped in expensive taxis and I got back at 3am. Next day woke up late, left house later still, met MC and Cas in O’Niells near Kings Cross to watch Celtic vs Aberdeen (which was quite good, especially when a Celtic player ran full on into a copper). Ate the remains of their full breakies (I wasn’t that hungry for some reason) and gradually the group arrived, all drinking the hair of the dog that had bitten them. Decided to go and hit up Camden market. That place is fantastic! Loads of weird, creative and hard to find stuff there. If I’m ever caught short for a gift that’s where I’m going. Also if I’m ever in the mood to go raving and want some neon orange spikey trousers, I will also go there. Anyway, after some Earl Grey and antiques I headed back to drop the white hoodie back home and get into some gear to meet up in Hammersmith for the evening drinks. Met at some bar somewhere in Hammersmith, fortunately it was one of the chain pubs that are quite prevalent down here, so drinks weren’t much. Had a Chicken Club Sarnie for tea! Haven’t had one since Whistler and frankly… it was a let down compared to Merlins. Still, good live music I’ve got to admit, even if they couldn’t get the levels right. 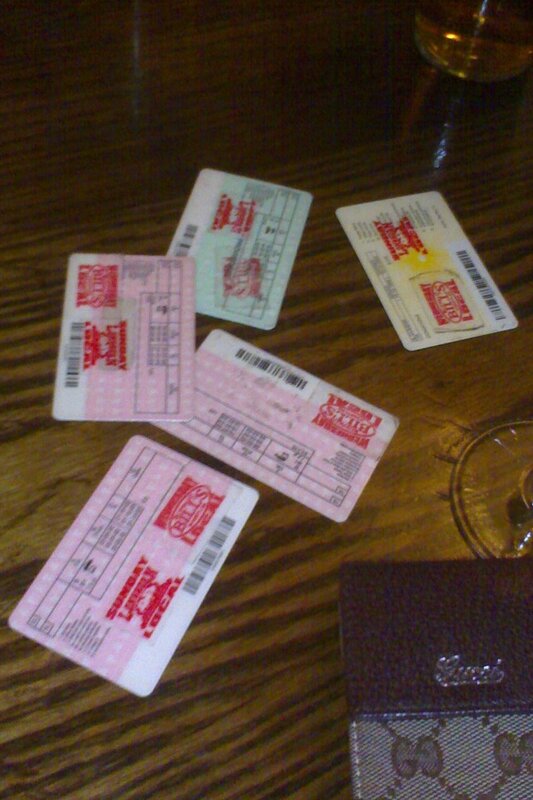 Moved onto Lloydd’s where we were searched at the door and even had IN BETWEEN THE NOTES IN OUR WALLETS CHECKED! They checked that but failed to find the blister packet of flu tablets I had in the top pocket of my jacket (to be fair, I forgot they were there as well). Slammed 4 of those then headed to some bar in Fulham where we queued for ages to spent £10 (that’s a lot) to get into some club where you couldn’t move whatsoever and drinks were expensive (Janet and Andy, realising what this would be like, headed home beforehand). A good night was still had by all! On the way out we were all stood about when suddenly I see Shane lurch forward, and 3 or 4 blokes behind him, one wielding a chair, kick off. Note to Alan: Do not stand in the middle of that and then say “They wouldn’t have started on me” when I pull you back from it. Note to MC: You seemed well defended on the other side of the croud, and Caroline was trumpeting how good you were in a fight. Said our goodbyes at that point, we knew that Sunday was a complete writeoff. Infact I went and got an £11 desk at Ikea on Sunday to stop myself spending any more money. Then Alan and Hayley and Me went to see Hot Fuzz, which is hilarious! To all that we’re there: it was fantastic seeing you all! Will have to organise another, T in the Park or Leeds Festival anyone? To all that couldn’t make it: you were missed and reminisced about. Let us know if your in Blighty and we’ll meet up. We all still had local's stickers from Whistler!